A chef has flown from Scotland to Italy to create the world's most expensive pizza for a St Valentine's Day meal. Award-winning Glasgow restaurateur Domenico Crolla will prepare the £2,150 (3,000-euro) feast for lawyer Maurizio Morelli and his wife Sabrina in Rome. 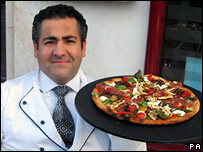 Mr Morelli, a gastro-expert, bought the pizza during a charity auction. The treat named the Pizza Royale 007 is topped with edible gold, lobster marinated in the finest cognac and champagne-soaked caviar. Other toppings on the organic base, spread with a sunblush tomato sauce, include Scottish smoked salmon and medallions of venison. Mr Crolla said: "This is the perfect romantic Valentine's gift. "We Italians are experts at amore and I think this pizza will show that the way to a woman's heart is definitely through her stomach." The pizza was created to raise funds for The Fred Hollows Foundation, which aims to prevent curable blindness in developing countries. The title for world's most expensive pizza was previously held by a £100 white truffle, mushroom and fontina cheese pizza at Gordon Ramsay's Maze restaurant in London.